Assam: can BJP defy history? The dates for the assembly elections in West Bengal, Tamil Nadu, Kerala and Assam and Puducherry have already been declared. After losses in Delhi and Bihar, these assembly polls have particular relevance for the Bharatiya Janata Party (BJP). Its leadership will be keen to perform well to reclaim the political supremacy it established in the 16th general election. However, from among the states going to polls, the BJP only has a realistic chance in Assam. Before the last general election, the BJP was, at best, a marginal political player in Assam. The 2006 assembly election was its best performance, with the party managing a 12% vote share. However, there was a dramatic turnaround in the 2014 Lok Sabha elections, when it got a 36% vote share—winning seven of the 14 seats and leading in 69 assembly segments. Can the party repeat this performance in the upcoming polls to the state assembly? It is hard to comprehend politics in Assam without understanding its ethnic and religious make up. Sample this: more than one in three persons in Assam is a Muslim, accounting for 34% of the state’s population. In numbers, it is the second largest Muslim population in a state, after Jammu and Kashmir—a fact no political party can ignore. 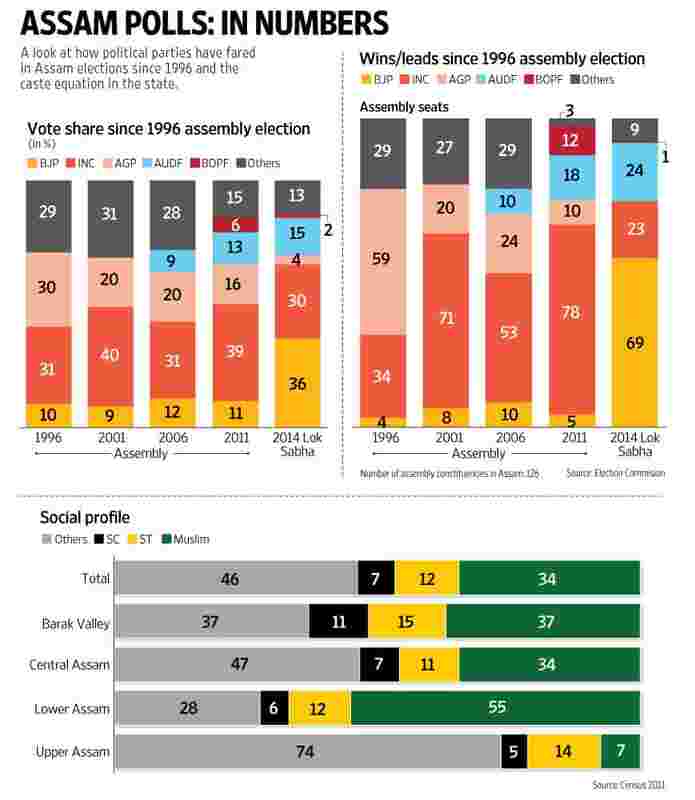 The dominant Muslim voter base, prima facie, does give a headstart to the Assam United Democratic Front (AUDF), a party largely representing the political aspirations of the Muslim population. The same applies to the Congress, which positions itself as a secular alternative. AUDF is an important player in Muslim-dominated areas, particularly in lower Assam, accounting for 54% of the Muslim population, where it polled more votes than the Congress in the 2014 Lok Sabha elections. However, these votes are unlikely to be divided, and the Muslim vote will consolidate behind the candidate who stands a better chance of beating their BJP rival. Besides the Hindu-Muslim divide, other ethnic groups will also play an important role in certain pockets. For example, the districts of Kokrajhar, Baksa, Chirang and Udalguri are home to Bodos. This area has seen rapid growth of the Muslim population. The proportion of Scheduled Tribes (mainly Bodos), constituting about a third of the population in these four districts, has shrunk. It is this demographic transition which triggered the recent violent skirmishes in the region. The BJP-led National Democratic Alliance (NDA) is expected to benefit from an alliance with Bodoland People’s Front (BOPF) and anti-Muslim sentiments in this belt. The Tea Tribes are another important socioeconomic group, accounting for more than 9% votes in the state. They are particularly significant in Sivasagar, Sonitpur, Tinsukia, Dibrugarh, Golaghat, Jorhat and Kokrajhar districts. In the past, the Tea Tribe has backed the Congress but the party’s defeat in the Tea Tribe-dominated Dibrugarh and Jorhat Lok Sabha constituencies in 2014 suggest this vote has drifted away. Two BJP members of Parliament (MPs), Rameshwar Teli from Dibrugarh and Kamakhya Prasad from Jorhat, will be key vote catchers for the BJP in this belt. Historically, a party needs minimum 35% votes to get a simple majority in Assam. The BJP polled 36% votes in the 2014 Lok Sabha election, which may be difficult to match in an assembly poll. This makes alliances critical. It is a fair assumption to make that the alliances with the Asom Gana Parishad (AGP) and the BOPF, will help the NDA cross 35% vote share. In the best case scenario, the NDA vote share can even inch towards the 40% mark—sufficient for a simple majority. Alarmed by the BJP’s initiative to stitch together a strong alliance, the Congress has responded by roping in the splinter Bodo party, United People’s Party (UPP). However, unless the Congress strikes a deal with AUDF, the political alliances favour the BJP. It is quite obvious that this election is as much a clash of political personalities as it is about ideologies and alliances. Chief minister Tarun Gogoi is undoubtedly the tallest political leader of Assam. The big question is whether his personal image will be sufficient to offset 15 years of anti-incumbency. Gogoi is pitched against the NDA’s Sarbananda Sonowal, who has grown in stature after becoming a Union minister. Besides, while the AGP as a party may have been marginalized, its chief Prafulla Mahanta still carries appeal among sections of voters. Thus, the alliance with the AGP will be a force multiplier in raising Sonowal’s stature. Induction of Himanta Biswa Sarma, who once controlled the grassroots machinery of the Congress and still considered very resourceful, will also strengthen Sonowal politically. Therefore, the trinity of Sonowal, Mahanta and Sarma, under leadership of Prime Minister Narendra Modi, looks a formidable force to take on Gogoi’s strong persona. Development and illegal migration are likely to dominate the narrative in this election. About one-third (10 million) of the state’s population continue to live below the poverty line. Despite ruling the state for three consecutive terms, the Congress does not have much to showcase on the development front. However, Gogoi has been smartly distributing freebies to specific voters groups, which does return electoral dividend. He has strategically been questioning Modi’s achievement—a move seen as an attempt to deflect attention from the anti-incumbency factor and make the Assam election a mandate on the central government’s performance. Thus, the BJP may counter the Congress’s efforts by strategically showcasing the Modi government’s achievements but with a greater focus on failures of the state government. In his 2014 Lok Sabha election campaign, Modi had raised the issue of “illegal migration" very strongly, and, perceptibly, his promise to chase out illegal migrants paid rich dividend. It is still a very emotive issue for a majority of Hindus in Assam. A section of anti-BJP forces in Assam is running a campaign that the prime minister has done nothing on this front. Despite such a campaign, the BJP is expected to gain on this issue because the Congress and the AUDF are largely considered two parties that are willing to appease illegal migrants. The updating of the National Register of Citizens (NRC) by the central government is expected to help the BJP politically, though a section of Assamese Hindus are not in favour of giving citizenship to the Bengali Hindu immigrants. On paper, the transfer of votes among the NDA partners should not be difficult because their support base shares a strong anti-Congress sentiment. That said, the aspirations of some local leaders of the BJP and AGP are so high that several of them may rebel if denied tickets; the recent split in the AGP only reinforces these fears. Thus, the NDA leadership will have to work hard at the local level to contain internal dissent. Over the years, the Congress has mastered the art of buying votes by distributing freebies among poor voters, and the BJP will find it difficult to match this. In addition, the 34%-strong Muslim vote is expected to get polarized against the NDA; thus even a little division in the non-Muslim vote will impact the NDA’s chances drastically. Showcasing the central government’s achievements will also be a tricky business because a little slip can take the focus away from the anti-incumbency against the state government. To sum up, with a strong alliance, the NDA looks slightly ahead of its opponents, at this point of time, but the Congress cannot be underestimated because of historical reasons. Modi and BJP president Amit Shah will have to work hard to turn the arithmetic into chemistry and defy history to set up its first government in Assam. Devendra Kumar is a psephologist and a member of the BJP.